Two independent studies published in Science and Nature show upgraded CRISPR derived editing tools which rewrite DNA like pencils instead of cutting like scissors, to change single-letter typos. David Liu et al. developed a modified CRISPR/Cas9 gene editor that converts DNA base Adenine to Guanine. Meanwhile, Feng Zhang et al. followed a different approach with re-engineering CRISPR/Cas13 to correct the same typos in RNA instead of DNA. With this method Adenine (A) turns into Inosine (I), which is read as a G by the cell its protein-building machinery. Both techniques enable editing without cleavage of the double helix. In human embryonic kidney cells and bone-cancer cells, the technique made the desired corrections with about 50% efficiency. 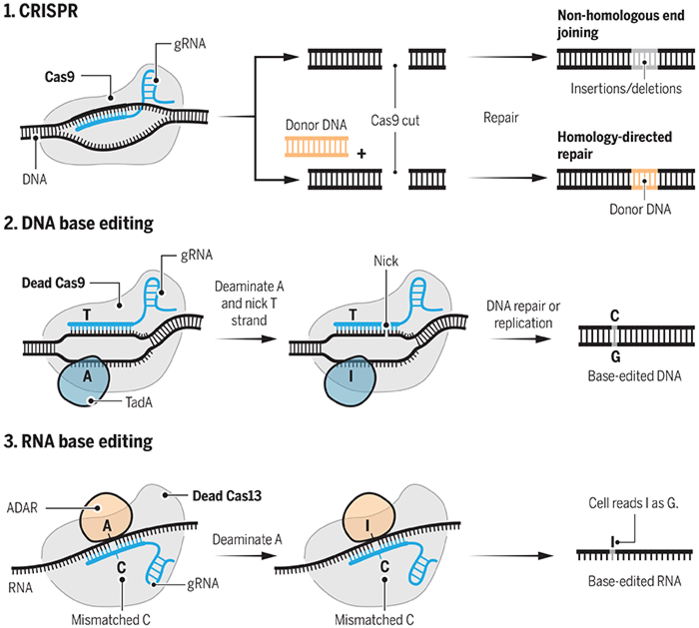 This is a major improvement in comparison to more conventional CRISPR-based method fixing the same single-base differences with less than 5% efficiency often causing undesired insertions or deletions of large chunks of DNA. While the long-running battle over US patents for CRISPR–Cas9 gene editing continues, these new tool sets will enable researchers to edit single base mutations with even more precision. Solid tumors rely on blood supply to survive. The angiogenesis around the tumor is a result of a complex interaction with many players involved and has been a major study focus for battling solid tumors. Researchers at the Albert Einstein College of Medicine showed the adrenergic nerves activating the formation of new blood vessels and subsequently stimulating the prostate tumor growth. Moreover, they explored the molecular mechanism with short-circuiting nerve stimulation to prevent new vessels from forming. The study shows that the communication between adrenergic nerves and endothelial cells of the blood vessel play a role in activation of an angiogenic switch that fuels tumor growth. Mechanistically, this occurs through alteration of endothelial cell metabolism. These findings unveil a new strategy for treating prostate cancer - one that we may be able to pursue using existing drugs which inhibits the β2-adrenergic receptor signaling. The study was published in Science. Challenging the Warburg effect: sugar and cancer, what is the link? The Warburg effect, named after the German cancer biologist Otto Warburg, has three main components: rapid glucose uptake, reduced glucose oxidation even when oxygen is present and secretion of lactate as a waste product. New finding challenges this century old observation with showing lactate is not merely a byproduct but also the driver in human non-small cell lung cancers (NSCLCs). The Tricarboxylic acid (TCA) cycle has been previously shown to drive the energy metabolism of NSCLCs. In this study, radio labelled 13C-lactate indicated the involvement of Lactate in the TCA metabolites, the same process is also associated with aggressive oncological behavior in NSCLS patients. Surprisingly, in vivo experiments show that Lactate intake predominates Glucose contribution to TCA cycle, emphasizing the Lactate metabolism as a fuel. The study was published in Cell. Targeted therapies that block PD-1 on T cells or its binding partner PD-L1 on tumor cells lead to increased T cell activity and a potentially greater antitumor immune response. However, PD-1 and PD-L1 inhibitors have demonstrated limited efficacy for patients with many other types of cancer, including breast cancer. The biggest challenge now is to understand why immunotherapy works for some patients and some cancer indications and not for many others. A new study shows that treatment with OX40 agonists in combination with PD-1 inhibitors can ameliorate the immune response. Strikingly, in the mouse model, infusing PD-1 inhibitors and OX40 agonists in sequential manner led to complete tumor regression in 30% of the mice and nearly doubled the concurrent combination treatment survival time. The results provide an insight to the delicate balance if combination therapies and suggest a precision approach to immunotherapy. The study was published in Clinical Cancer Research. The past few months have been rather exciting for ground breaking gene therapy approaches with CAR-T cell technology. Novartis’ Kymriah and Kite pharma’s (recently acquired by Gilead) Yescarta are the first two therapies to be approved. Both revolutionary approaches are put on a market with head spinning prices $475.000 and $373.000 consequently. These are not surprising numbers though, as personalized gene therapy remains an expensive method. In fact, the prices are so high that one gene therapy drug (Glybera) has already been pulled from the market in Europe, and the other (Strimvelis) has struggled to attract patients. However, unlike the previous medicines, Yescarta is proposed to target a broader patient group. 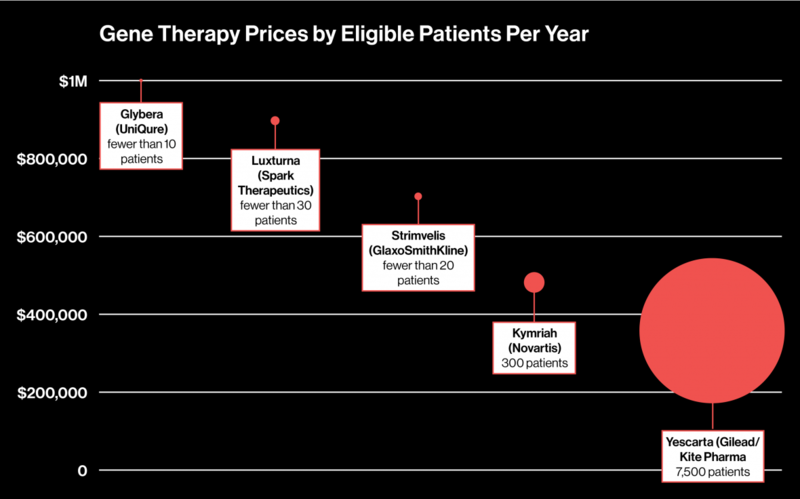 MIT technology reviews conducted a correlation research, tracking the cost of the gene therapy over the past years versus target patient population. The results indicate a correlation between the number of eligible patients and price of the therapy: the fewer eligible patients, the more expensive the drug is. Although the pricing dilemma is stirring insurers, patient advocates and companies, predictions indicate with more eligible patients, prices will lower incoming years. Similar CAR-T treatments are being developed by Juno Therapeutics (JUNO.O), bluebird bio (BLUE.O) and others, will be interesting to see if the prediction will hold for these medicines. Alectinib (Alecensa, Roche) as monotherapy for the first-line treatment of adult patients with anaplastic lymphoma kinase (ALK)-positive advanced NSCLC. The oral drug was earlier approved in the same indication for patients who worsened after or could not tolerate the ALK inhibitor crizotinib. Fulvestrant (Faslodex, Astra Zeneca) as monotherapy for the treatment of estrogen receptor positive, locally advanced or metastatic breast cancer in postmenopausal women, or in combination with palbociclib for the treatment of hormone receptor (HR)-positive, human epidermal growth factor receptor 2 (HER2)-negative locally advanced or metastatic breast cancer in women who have received prior endocrine therapy. Axicabtagene ciloleucel (Yescarta, Gilead), a CAR-T cell immunotherapy for the treatment of adult patients with relapsed or refractory large B-cell lymphoma after two or more lines of systemic therapy, including diffuse large B-cell lymphoma (DLBCL) not otherwise specified, primary mediastinal large B-cell lymphoma, high-grade B-cell lymphoma, and DLBCL arising from follicular lymphoma. Acalabrutinib (Calquence, AstraZeneca under license of Acerta Pharma) for treatment of adult patients with mantle cell lymphoma (MCL) who have received at least one prior therapy. The first-in-class BTK inhibitor received accelerated approval.